The tongue is one of the most popular body parts to pierce. Tongue piercing, which is done by piercing a needle through the middle of the tongue, is widely accepted throughout the Western world. Tongue piercing dates back to the ancient rituals of the Aztec and Mayan cultures. Because the tongue is a sensitive organ, piercings in this body region can be quite painful. After getting your tongue pierced you may experience swelling and pain in your mouth region. Sucking on ice cubes or drinking ice-cold water helps lessen pain and keep the swelling down. Taking Acetaminophen or Paracetamol will also help lessen the pain and keep the swelling down. It is important not to use any aspirin products, as this will promote more bleeding. To lessen tongue pain after a piercing, it is important to stay away from any irritants. Rubbing alcohol, iodine, Listerine and Gly-oxide can increase pain, as they contain acidic properties. Salt water is a good cleaning agent that is not painful and easy to administer to the tongue. 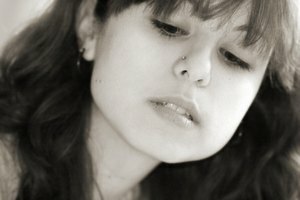 Playing with the piercing can increase both the amount and length of the pain caused by a piercing. Since a piercing is a new feeling in our mouths, it is only natural to feel the piercing with teeth, lips and gum. Leaving the piercing alone and not playing with it will increase healing time and decrease the amount of pain. Avoiding spicy foods is important when receiving a new tongue piercing. Try sticking to soft foods or liquids, such as milkshakes, for the first week to allow time for the piercing to heal. Hard and sticky foods should be avoided as well--they can move or push the piercing into your tongue creating more pain. During the healing time of your new tongue piercing, watch for warning signs that indicate an infection. If you notice a yellow or green discharge from the piercing or increased pain, bleeding, or swelling--or if you develop a low-grade fever--get medical attention. What Can You Eat When You Have a Tongue Ring?